I freaking LOVE the name… who the hell doesn’t want to be the Diva of Geneva? This is the only one from the Swiss Collection that really shouted to me… my “maybes” list is longer, but I’ve mostly plumped for China Glaze Vintage Vixen shades for this coming season. 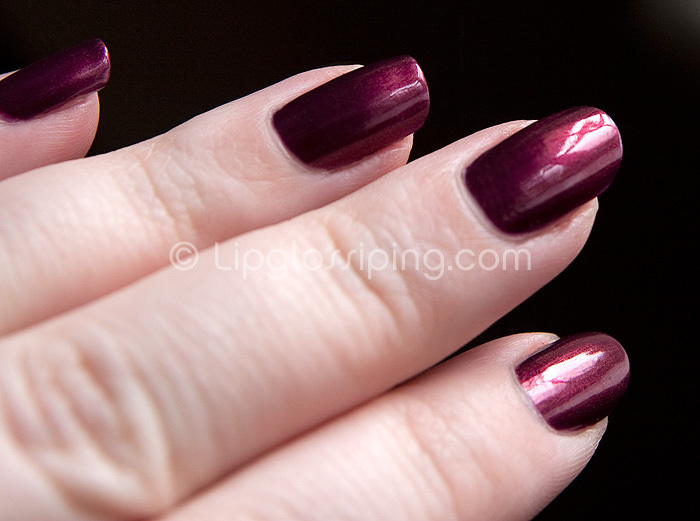 Diva of Geneva is a beautiful red based purple…. it almost looks pink in some lights. A perfect shimmer finish that really complements my skintone, I’m gonna get a lot of wear from this shade. 3 coats for a perfect finish, 2 if you’re more heavy handed. Drying time was fine and it was a joy to remind myself of the OPI brush… lovely application. I picked this up from one of my favourite U.S. eBay sellers: BeautyZone2007 who is one of the best for combined shipping charges. What are you lemming from the O.P.I Swiss Collection? Glitzerland I think it’s called but I’m more interested in CG. Camel, Ingrid and Riveter Rouge. I’m totally wearing this right now! It sure is purdy. It looks lavishly vampy ahlavet!!! This is the first OPI nail polish I will be purchasing, absolutely gorgeous. I have bought a lot from BeautyZone, always been happy with their prompt service and the excellent choice of varnishes they have P&P is reasonable as well… you still end up with stuff much cheaper (P&P included) than if you bought them from ebay uk ! I bought Cuckoo For This Color which I have done a post on, but I am also lemming Lucerne-Tainly Look Marvelous as well as Diva of Geneva. This does look fab, it has something to it which makes it a little more special then the bog standard cherry/plum shades. Very glossy – like ripe plums….no sniggering! This is a special and beautiful colour, just up my street and the very one I’ve been lusting after. It looks really good on you too! but I think it will look weird against my yellow undertone. What do you think? It is quite a cool-toned shade… can you normally wear purples ok? I can wear purple, but pink is another story. Most pink looks weird on me.